I think I have mentioned before that I am completely obsessed with yummy salads! 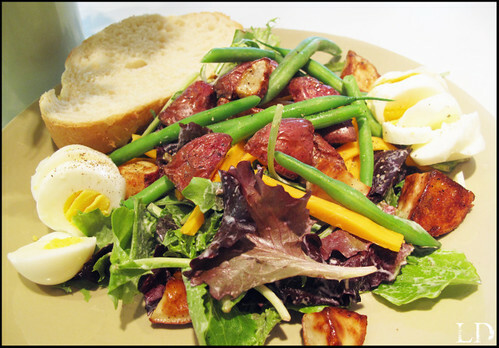 Here is a fresh Spring Salad that is healthy, earthy and very satisfying. This salad would be perfect for a Sunday brunch or a quick healthy dinner. I hope you like it as much as I do. Boil your eggs just until the centers are cooked, about 10 minutes. Just before you drain the water from your eggs quickly blanch your green beans in the same boiling water. Do not over cook, just a quick 1 min in the boiling water is perfect for your green beans. Peel your eggs while hot and set aside to cool. Wash and dice your red potatoes, place them on a cookie sheet and drench in olive oil and season with salt and pepper. Bake at 425˙until potatoes are crisp and golden brown. Take your potatoes out of the oven and set aside to let cool. Slice your sharp cheddar cheese, and hard boiled eggs. When all of your ingredients are cool, assemble your Spring Salad. Toss with your buttermilk dressing and season with salt and pepper. Yum, I love the idea of combining roasted potatoes and salad. Lately, I've been roasting sweet potatoes along with the red ones. Usually, I serve this alongside grilled chicken, but to put it in a salad sounds divine.